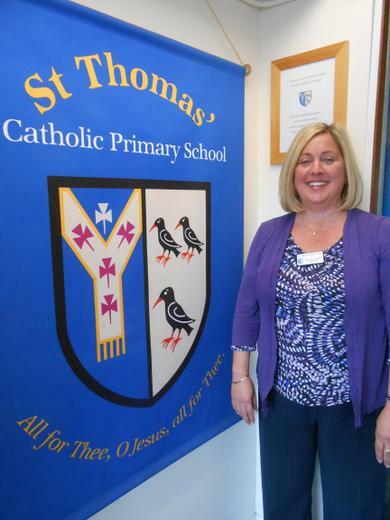 Welcome to St Thomas’ Catholic Primary. Our website was launched in February 2015 and is very easy to navigate. It will give you a flavour of life at our school. St Thomas’ is a happy, friendly, caring and welcoming community, which places Christ at its centre - in the words of part of our school prayer - “All for Thee O Jesus, all for Thee”. We are very proud of our school, which has served our local Catholic community since 1870. Whilst we have a high proportion of Catholic children, we also have pupils from other faiths who greatly add to the rich diversity of our school family. The multi-cultural dimension means that our pupils learn to respect and appreciate other cultures and faiths, preparing them for the world in which we live. Governors, staff, pupils, parents and parish all work together in order to strive for excellence in all aspects of education. This is evident from our test results, which can be located within the key information section of our website. Our pupils leave St Thomas’ as motivated and confident learners, who are independent, show initiative and are self-disciplined. More importantly they acquire the life skills and values we hold dear. We recognise that every child is “unique”, with their own individual talents and therefore it is the responsibility of everyone in our school community to enable our pupils to reach their full potential.